We love capacitive touch screens. They’re much more robust than resistive touch screens and if the UI is programmed well they produce a great user experience. But getting your electronics project to interact with one is a bit tough. [RobB] has been experimenting in that area, and managed to build a simple touchscreen actuator for microcontroller use. In the video after the break you can see his proof of concept. 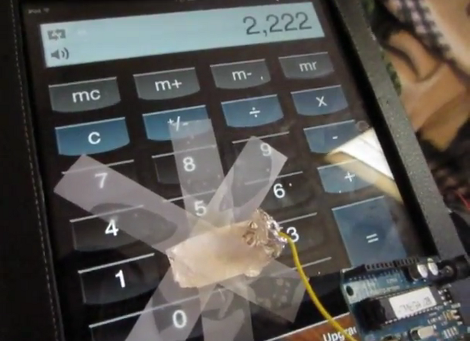 He’s using an Arduino to enter the number 2 on an Android iOS calculator app once every second. It doesn’t take much to pull off this trick, [RopB] just taped a piece of tin foil to the screen and connected it to the Arduino with a jumper wire. The pin is left floating until a screen tap is needed, at which point it is pulled to ground. A custom app operating at slow speeds could use this as an input technique. Two pieces of foil (one acting as clock, the other data) would provide a rudimentary serial transfer system. [Ben Peoples] works in theatrical electronics. Sounds like fun, and here’s an example of the kind of stuff he does. 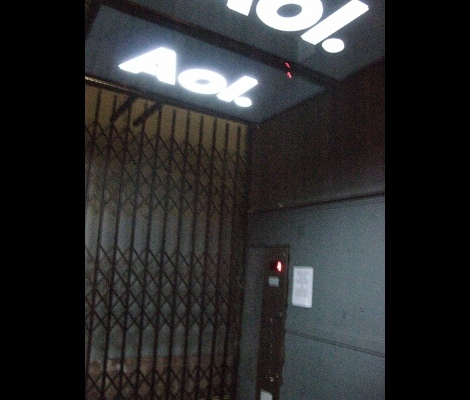 We’re not sure what event this installation was used for, but if the elevator ride needed something flashy just think of what the party room must have looked like. These HDTV screens on the ceiling of the elevator play different clips when the elevator is moving up or down. The challenge for [Ben] was to find a way to make it work without tapping into the elevator electronics or requiring any button presses. The first attempt at sensing the elevator’s travel was done with an accelerometer. The problem with this approach is that an accelerometer only senses change in acceleration and this method proved to be fairly error prone. [Ben] switched over to a reflective sensor which performed quite well. Since most of these sensors will only work within about an eighth of an inch he ended up building his own with a LDR and a couple of amber LEDs. We normally try to be descriptive with our titles. But when that statement pops out of the narration with notable excitement it made us chuckle. This installment of Retrotechtacular is a promotional video for the Blit. 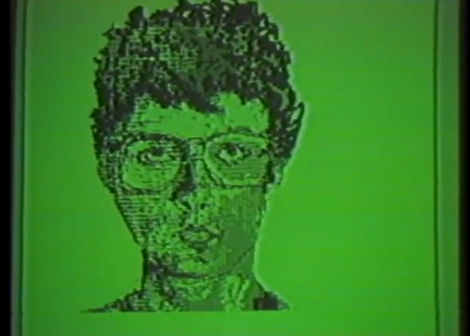 It’s a graphics-based hardware terminal for Unix systems. It’s biggest boast is the ability to run (and display on screen) several different programs at once — an activity called multiprogramming. But there is also the “digitizing mouse”. On board is a 68000 microcprocessor 256k of RAM (they call it a quarter meg), and connects via RS232. The screen is 800 by 1024; that’s right, it’s a portrait orientation. Notable in this episode are some classic eyeglass frames, and rad synthesizer sounds for scene transitions. Whatever happened to videography technique that uses a dimwitted companion to ask that all-knowing narrator stupid questions? [CarryTheWhat] put up an Instructable on his endeavours in printing circuit boards for solder free electronics. He managed to print a flashlight where the only non-printed parts are a pair of batteries and a couple of LEDs. The circuit is a weird mix of point to point and Manhattan style circuit construction; after modeling a printed plastic plate, [CarryTheWhat] added a few custom component holders to hold LEDs, batteries, and other tiny electronic bits. To deliver power to each electronic bit, the components are tied off on blue pegs. These pegs are attached to each other by conductive thread much like wirewrap circuit construction. Right now, the circuits are extremely simple, but they really remind us of a few vintage ham radio rigs. While this method is most likely too complex to print 3D printer electronics (a much desired and elusive goal), it’s very possible to replicate some of the simpler projects we see on Hackaday. [CarryTheWhat] put the models and files up on GitHub if you’d like to try out a build of your own. If you’ve ever found yourself wondering if there’s any possible way to let those with deficient olfactory senses know just how flatulent you are, wonder no more. The Gas Cap is here to fulfill that very need. A bar graph of sorts, located on the front of a hat that will light up to reflect the amount of methane sensed near your, uh, exhaust port. This project cost around $100, though a good portion of that went to the Xbee modules so that the detector could be separated from the hat, allowing for remote fart notifications. This seems to be a project that is not as uncommon as one might assume. We’ve seen fart intensity detectors as well as tweeting chairs that alert the world when you pass gas.